Before today’s groundswell of yoga there was Charles Atlas in the 1920s and Joe Wieder in the 1930s, he-men manufacturing “97-pound weaklings into men.” Jack LaLanne, the godfather of physical fitness, opened his first health studio in California. Resistance training gained ground and Nautilus was invented in the 1940s. Isometrics or “motionless exercise” was the rage in the 1950s, and Universal introduced its first multi-station weight-training machines. Dr Kenneth Cooper’s aerobic training popularized jogging in the 1960s and in the 1970s modern health clubs began to spring up. In the 1980s Jane Fonda brought aerobics to the masses. Aerobicise, the world’s highest-grossing exercise video of all time, was produced, and the weight-loss fitness personality Richard Simmons became a household name. In the 1990s step aerobics was wildly popular, Madonna inspired women to weight train, riding a bike became spinning, and Tae Bo, or fitness kickboxing, was the hottest trend of the 1990s. In the new century boot-camp style workouts, Latin dance, or Zumba, and Pilates were top fitness trends. But, in terms of growth, from the late 1990s through today, nothing has matched the marketplace expansion of yoga. In 2009 the National Sporting Goods Association reported that among activities in which more than 10 million people participated, yoga was the fastest growing of them all, its rise measured at a rate of 21% annually. This compared to 3% for aerobic exercise, 2% for weight lifting, and 1% for jogging. Spending on yoga products has increased by 87% in the past 5 years, according to the Yoga Business Academy. Doctors sometimes recommend it to their patients and a few insurance companies already pay for the practice. The wellness industry is bringing it into its fold and the corporate world is busy mainstreaming it. 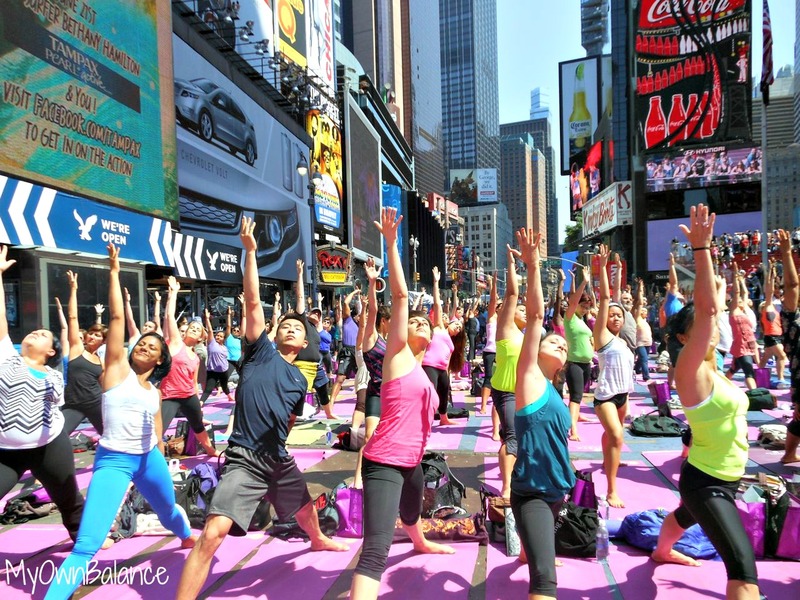 Approximately one in sixteen Americans currently practice yoga. The consequences for the American way of life would be both confounding and devastating. Many people practice yoga on a physical level, going to yoga exercise studios or unrolling their mats at home. Yoga practice has specific health benefits, including greater range of motion, strength, muscle tone, pain prevention, and better breathing. Yoga breathing calms the central nervous system, which has both physical and mental benefits. Scientific studies have proven that spinal flexibility and cardiovascular health markers improve with yoga exercise. According to the Yoga Health Foundation the health issues yoga addresses include chronic backache, depression, diabetes, menopause, stress, asthma, obesity and heart disease, not to mention arthritis. More than one in five Americans suffer from arthritis, according to the Centers for Disease Control and Prevention. The number of Americans with arthritis is expected to climb to 67 million by 2030, estimates the Arthritis Foundation. For many people who practice yoga it is a game changer. Given its applicability and success in dealing with many physical ailments, yoga practice poses a serious threat to the American healthcare industry. Americans spend more than $8 thousand dollars per person, man, woman, and child, on healthcare every year. The American healthcare industry is the largest of its kind in the world. According to the World Health Organization spending in the USA on healthcare is close to 20% of GDP, the highest by far on the globe, even though American healthcare is ranked 37th in overall performance and only 72nd in overall health of its population. American health insurance companies increased their profits by 56 percent in 2009. A recent report by Health Care for America Now noted that the country’s five biggest for-profit health insurance companies ended 2009 with a combined profit of $12.2 billion. There are 784,626 healthcare companies employing almost 17 million people in the United States. According to the US Department of Labor the healthcare industry added on average 26,000 jobs to the economy every month in 2012. The more people practice yoga the less likely they might be to need the services of the healthcare industry. That could spell trouble for an industry that employs approximately one of every eight Americans. For example, more than $86 billion dollars are spent annually in the USA treating back pain, according to The Journal of the American Medical Association. If most of that money were extracted from the economy because everyone was practicing yoga and there were far fewer back problems for doctors to treat, it would result in significant downsizing and unemployment among healthcare workers. Arthritis is one of the top 5 health problems plaguing Americans today. The total annual tab for treating arthritis exceeds $100 billion dollars annually, from prescription drugs to surgery. Everyone recommends exercise, or simply movement of any kind, from family doctors to the Arthritis Foundation. The reason is that exercise makes synovial fluid move within joints. The element that supplies nourishment and lubrication to joints is specifically this fluid. The flexibility and pivoting of joints is only possible because of it. One positive effect of yoga practice is to get synovial fluid flowing. “One thing that yoga does for sure is move the joints into extreme but safe positions, allowing the obscure corners and crevices of each joint to be awash with lubricating, life-sustaining fluid,” write Dr. Loren Fishman and Ellen Saltonstall in Yoga for Arthritis. If everyone practiced yoga asanas, and if even half of them were able to stabilize or reverse their arthritis issues, the end result would be a loss in the range of $50 billion annually to the healthcare industry, forcing more contractions and subsequent lay-offs of personnel. Heart disease is the leading cause of death in the United States, according to the American Heart Association. Approximately 600,000 people died because of it in 2011. Among those who practice yoga it has long been known to be good for the heart, in more ways than one. Now even the medical community is chiming in. “A small but promising body of research suggests that yoga’s combination of stretching, gentle activity, breathing, and mindfulness may have special benefits for people with cardiovascular disease,” writes Harvard Health Publications. Even if not a panacea, if yoga practice could make a dent in half of the heart disease in the USA, it would not only alleviate a great deal of suffering, it would significantly cut into the direct medical costs of the malady. One study estimated that over the course of a person’s lifetime, the cost of coming down with severe coronary artery disease is more than $1 million. Even if you don’t develop heart disease, it is still costing you. “You’re paying for cardiovascular disease whether you have it or not,” said Paul Heidereich, a cardiologist at the VA Palo Alto Health Care System in California, and Associate Professor of Medicine at Stanford University. “You’re paying for it in your taxes and your health insurance premiums.” He estimates that the average person in the USA is paying $878 per year for the societal costs of heart disease. The consequences for the healthcare industry of everyone in America practicing yoga become clear when focusing on lower back pain, arthritis, and heart disease. The result would be severe dislocations and unemployment, as well as the loss of significant revenue for hospitals, clinics, and doctors, not to mention support personnel and vendors. Obesity in America would also likely be trimmed to manageable levels, or reduced to nothing, if everyone practiced yoga. More than one-third of all Americans are obese, according to the Centers for Disease Control and Prevention. Obesity is defined as having an excessive amount of body fat, or a body mass index over 30, says the Mayo Clinic. Since 1988 in the USA obesity has dramatically increased in adults at all income and education levels. Current estimates suggest that the yearly medical costs of adult obesity are between $147 billion and $210 billion. The weight loss and diet control market has been estimated to have reached $60 billion a year, led by commercial diet chains, multi-level marketing diet plans, and retail meal replacements and diet pills. Although not primarily known as an aerobic activity, or an activity that raises ones metabolic rate, which is belied by such 90-minute practices as Ashtanga and Vinyasa, yoga has long been known to be a practice that changes people’s bodies and keeps them changed. Yoga professionals are more emphatic about yoga’s weight loss capabilities. “Yoga facilitates weight loss in several ways and, when combined with evidence-based nutritional guidance, can be highly effective,” said Annie Kay, Lead Nutritionist at the Kripalu Center for Yoga & Health. Doing an about-face on obesity could cost the American economy $270 billion a year. Although universal yoga practice would be dire for the healthcare industry, the picture for normative life in America gets worse when a light is shone on the rest of yoga, not simply on the physical exercise aspect of it. If everyone practiced all eight limbs of yoga, society in America as we know it could very well be transformed, or collapse. Next: The repercussions of practicing all the 8 limbs of yoga.